What's Happening to Hawaii's Push for Criminal Justice Reform? What’s Happening to Hawaii’s Push for Criminal Justice Reform? In 2012, the state’s Justice Reinvestment Initiative set lofty goals to achieve higher efficiency and a lower inmate population. There’s been practically no progress so far. 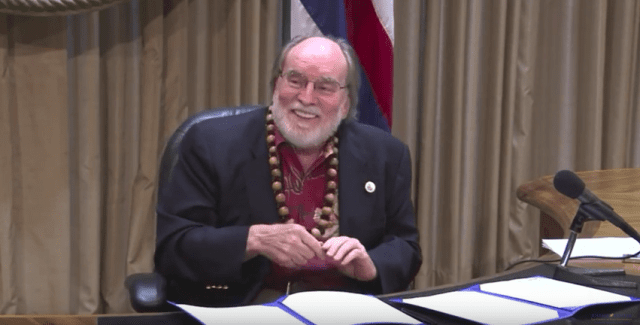 As he marched into the executive suite at the Hawaii State Capitol, a brown-nut lei around his neck, Neil Abercrombie was beaming. 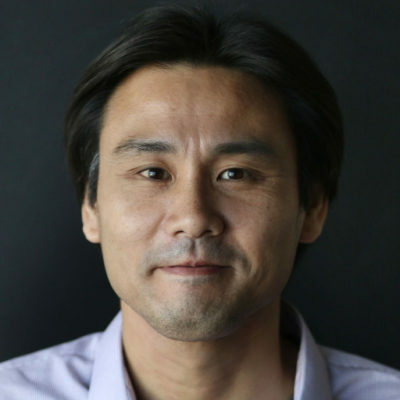 It was June 20, 2012, and the then-governor was about to sign into law two landmark measures — House Bill 2515 and Senate Bill 2776 — that were close to his heart. The bills were aimed at overhauling Hawaii’s criminal justice system by making it more efficient and shifting resources to efforts that promote rehabilitation and reduce recidivism — under a program called the Justice Reinvestment Initiative. The ultimate goal: dramatically reduce the state’s inmate population and achieve significant cost savings along with it. A former probation officer, Abercrombie was all for the JRI. In June 2012, Gov. Neil Abercrombie signed into law two bills that promised a sweeping overhaul of Hawaii’s criminal justice system. “With the enactment of these bills, I believe we’re taking the next step forward in our commitment to control our criminal justice system, exercising resources in a sensible and clear-sighted, clear-headed manner in Hawaii, and strengthening the capacity for people to return to society,” Abercrombie said, as he addressed a bipartisan group of lawmakers and advocates who had gathered for the bill signings. The JRI’s adoption represented Hawaii’s boldest foray into criminal justice reform, a movement that has taken hold nationwide in recent years with bipartisan support in the belief that an incarceration-based system has come at enormous moral and financial costs. More than three years later, the JRI isn’t living up to its lofty expectations. According to the Council of State Governments Justice Center, which provided technical assistance, the JRI was projected to help reduce the state’s inmate population by more than 900 by the end of fiscal year 2015 — and eventually lead to a reduction of 1,010 inmates by fiscal year 2018. But, as of May 31, Hawaii’s inmate population stood at 5,998 — merely 62 fewer inmates than in June 2012. Gov. David Ige, who as a state senator supported the JRI’s establishment in 2012, chalks it up to the difficulty in putting theories into practice — “the devil is in the details,” is how he put it to Civil Beat. Still, Ige said he’s not giving up on the JRI. 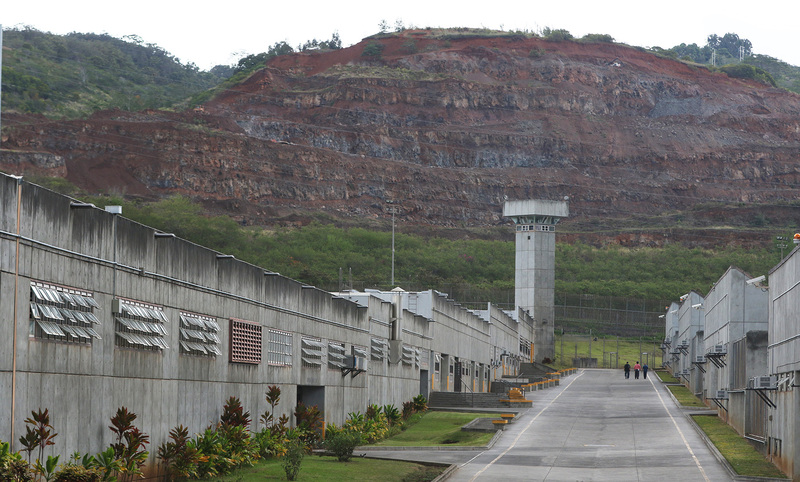 By 2011, Hawaii’s inmate population exceeded 6,000, including those housed at the Halawa Correctional Facility. The impetus for adopting the JRI was a growing dissatisfaction with Hawaii’s criminal justice system. 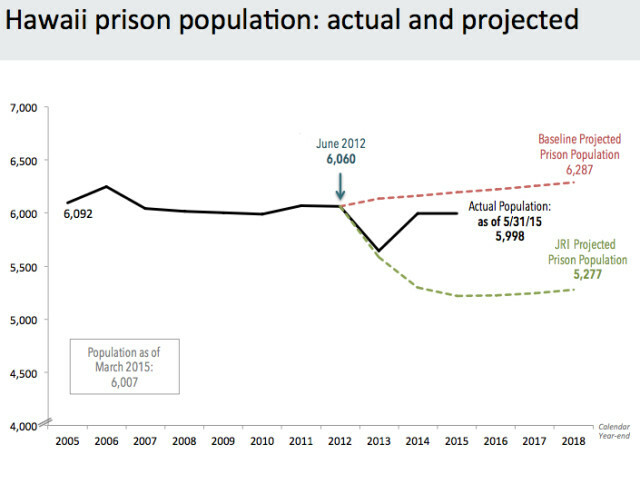 From 2000 to 2011, Hawaii’s inmate population shot up 18 percent to 6,043 — about a third of whom were housed in mainland prisons contracted to augment the state’s overcrowded facilities. Meanwhile, the spending by the Hawaii Department of Public Safety’s corrections division increased by 71 percent, from $112 million to $192 million. All this, while Hawaii’s rate of index crimes — those tracked by the FBI — was declining 31 percent, from 5,199 to 3,577 per 100,000 people. State officials knew that something had to give. Eventually, they created the Justice Reinvestment Working Group to explore policy solutions by collecting and analyzing the data from every facet of the state’s criminal justice system, with technical assistance from the Council of State Governments Justice Center and in partnership with the U.S. Justice Department’s Bureau of Justice Assistance and the Pew Center on the States. This data-driven approach had already proven successful on the mainland. Texas, for instance, adopted the JRI-based policies in 2007 and went on to save $684 million in construction and operating costs for new prisons — and then “reinvested” $241 million of the savings to beef up in-prison and community-based programs. Hawaii’s working group spent seven months analyzing the data and emerged with recommendations based around three principles. The first was focused on increasing efficiency. It called for timely risk assessments of pretrial inmates to reduce lengthy stays in jail. The second was about promoting rehabilitation and reducing recidivism. It focused on shifting probation and parole resources to offenders judged at the highest risk of trouble, while easing supervision and lengthy incarceration of others. The third was aimed at bringing accountability. It urged improvements in how victim restitution money was collected and pushed for oversight and services for every inmate re-entering the communities. The recommendations were projected to lead to a savings of more than $130 million by the end of fiscal year 2018 and allow the state to reinvest $42 million into strategies that promote rehabilitation and reduce recidivism. During the 2012 session, the Legislature incorporated most of the recommendations into the two bills that Abercrombie ultimately signed. But the JRI has so far failed to achieve its projected impacts, largely because many of its policy prescriptions have yet to bear fruit. In fiscal year 2015, for instance, pretrial inmates who ultimately got released on bail were still held for an average of 32 days in jail before their release — the same length as in fiscal year 2011, even though the state has been conducting pretrial assessments within three days of inmates’ booking, as mandated under the JRI. And the Hawaii Paroling Authority has been granting parole to about 35 percent of prisoners who come before the parole board. That rate has remained about the same from fiscal years 2012 to 2014, even though the $3.4 million that the JRI receives each year from the Legislature has allowed the hiring of four full-time parole officers and the addition of two parole board members — with the idea that they’d increase the capacity to release more prisoners on parole. It doesn’t help that Hawaii has an acute shortage of in-prison and community-based programs that are needed to help parolees transition safely back into their communities. That’s why the Legislature allocated $1 million in 2012 to beef up community-based programs, but $450,000 of the funds went to two programs on the Big Island, instead of Oahu, where there are more inmates in need of services. Without sufficient supervision of inmates and related services, Honolulu Prosecuting Attorney Keith Kaneshiro says the JRI poses a threat to public safety. But Abercrombie told Civil Beat that the JRI can still go on to achieve great results — so long as it’s implemented “with fidelity” to its model. State Rep. Gregg Takayama, chair of the House Public Safety Committee, concurs. State Sen. Will Espero, vice chair of the Senate Public Safety Committee, also agrees that it’s too early to write off the JRI. For her part, Kat Brady, coordinator of the Community Alliance on Prisons, says Ige needs to step up and show his leadership if he really supports the JRI.